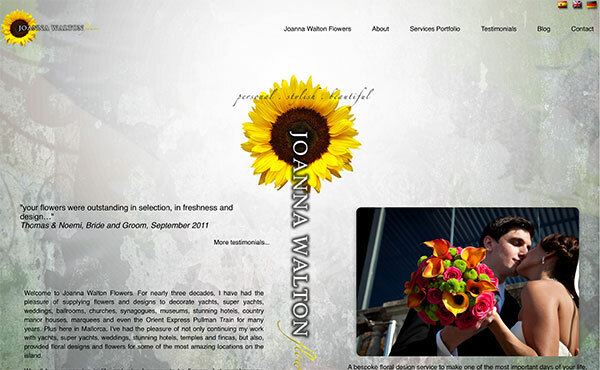 Joanna´s Mallorca Flowers Blog: The refreshed 2015 Joanna Walton Flowers Website is here! It's lighter, cleaner, and just gorgeous! We've been very happy with our website, www.joannawalton.com, for the past few years, but we felt it was due for a refresh. We wanted something that kept some of that cool feel of the old one, but made it lighter, cleaner, simpler, and easier overall to view the content and information that you're looking for. So we got to work this winter with the folks at Francisco Tomas Fernandez, who also designed our last website, and they've created something truly beautiful. The information architecture is simpler and less confusing, which means you can easily get to what you want to view immediately, and the services and portfolio sections have been merged into a single area, where you can instantly skip from gallery to gallery and get the services information you want along with its corresponding portfolio. It's also a lot easier on the eyes, making the content more accessible and pleasant to peruse. It's also all fully mobile compatible, offering the full desktop experience on your iPhone or iPad. The new portfolio galleries are simply gorgeous, and don't forget to visit the contact page, not only to contact us, but to delight in the beauty of the integrated photo gallery selection. Some of you had commented that it would be nice to have a quick, one view portfolio sample without navigating into each portfolio section. Well now you have one on the home page and the contact page. Each one has a couple of photos from the different styles and services we offer, so that simply by visiting the home page, you get a sample of our work. It's currently available in English and Spanish. German will be available soon. Update: Updated to reflect the completion of the Spanish version.